ATJ's Home Improvement | News and Alerts | Hardie or Vinyl Siding for Your Chicago Area Home? Hardie or Vinyl Siding for Your Chicago Area Home? HardiePlank is a fiber cement siding product that is extremely durable, has an embossed wood grain pattern and comes pre-primed from the manufacturer. Generally speaking, hardie is superior to vinyl in many ways. First of all, its thickness. Hardie plank is as thick as a real wood lap siding. While thicknesses do vary, an average thickness of HardiePlank is 5/16", or over a quarter-inch. Vinyl siding is mere millimeters thick. Once a product is installed, you can’t really see the difference in terms of thickness, but durability-wise, hardie wins hands down. Another important quality is combustibility. HardiePlank is composed of cement-like materials and about 10% to 15% cellulose (wood) fibers. The bottom lines: HardiePlank will not burn. Vinyl siding is treated with fire retardant, but this only retards or mitigates the spread of fire. It’s a well-known fact that houses with vinyl siding can badly warp in response to the adjacent heat, even though the fire is as far as 60 feet away. Vinyl siding is known to melt a little even after a very hot summer. To be fair, slight melting doesn’t necessarily impact its durability, but some homeowners are not happy about the way it looks. In addition, freezing temperatures makes vinyl siding more prone to cracking, whereas HardiePlank, being essentially a long, thin sheet of concrete, may crack upon impact, but it will not warp or melt. Finally, hardie has a distinct texture that is advantageous for consumers. Thickness allows for deep relief, so that it looks like wood. Vinyl siding usually does have a wood-like relief, but the product is too thin to allow for the deep textures found on HardiePlank (or real wood, for that matter). HardiePlank is a fiber cement siding product that is extremely durable, has an embossed wood grain pattern and comes pre-primed from the manufacturer. When installing HardiePlank siding, you blind nail the board just like a traditional wood lap siding, but cutting and nailing the siding can be a bit more difficult because the fiber cement is dense and oftentimes brittle. The siding boards come in 12-foot lengths that cost about $8 per stick, and of course the factory primed products do need to be painted on site. Although there are many less expensive vinyl sidings available, they are not going to perform as well as the HardiePlank. Vinyl siding is made of plastic and if installed correctly can help a home owner achieve a low maintenance home. Vinyl has been widely sold since the early 1980s and is best installed by an experienced installer. 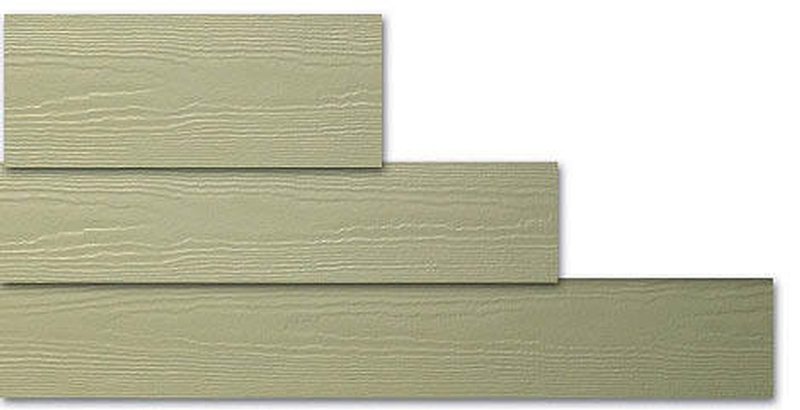 Vinyl is the same color all the way through and typically is installed over your existing wood. If you have rotted or warped wood, it is recommended to have the rot replaced with new wood so that the wall surface is sound and flat. The upside to vinyl is that it can be installed quickly and is relatively low-maintenance. The downside to owning vinyl siding is that it a thing of the past. There is not very much vinyl siding being sold anymore, as more and more home owners prefer a more up-to-date look and don’t like the looks of vinyl because it can have a fake plastic appearance. Real estate agents are hearing more today that if the house has vinyl on it, the buyer would prefer to see something else. At one time, over 20 years ago, vinyl would enhance the value and look of a home. Everything evolves over time, even building materials. In order to give you a full picture, there’s also a Certainteed Mainstreet Vinyl Siding. This siding product is a premium grade of vinyl siding that should perform way better, but costs more, than most entry level vinyl products. This type of vinyl siding is a good comparison to the HardiePlank, because of its similar aesthetic qualities. The Mainstreet siding series offers a horizontal panel that has an 8-inch lap reveal, an embossed wood grain, and is ready to install right out of the box. Of course, most vinyl products do not need to be painted, but they do need to be installed over a flat layer of exterior rigid insulation. The panels come in 12-foot lengths, and Certainteed’s Mainstreet series has a beefed up nailing hem and locking mechanism, which the company claims gives the panels a better wind and weather resistance. All in all, although there are many less expensive vinyl sidings available, they are not going to perform as well as the HardiePlank.